Loreena McKennitt visited Portland last night, performing to a near capacity crowd at the Arlene Schnitzer Concert Hall. In addition to being highly entertaining, her performance was equal parts mystical, ethereal, and soothing. More succinctly, McKennitt was superb as she spun musical tales rooted in Celtic verse and history. Performing as a trio with cellist Caroline Lavelle and guitarist Brian Hughes, she guided the audience through two plus hours of her music, largely drawing from her 2012 album Troubadours on the Rhine. Joining the trio on fiddle for several songs was Errol Fischer. I don't remember exactly when I was first drawn to her music, but her 1997 album The Book of Secrets remains a mainstay in my record collection and something I turn to whenever I want to be swept away by her incredible vocal range, complex arrangements, and transcendental stories of a time and place where history was transmitted through song and verse. A natural storyteller, McKennitt relayed tales of Irish history, particularly the potato famine of the 1840's, which cut the Irish population of eight million in half, killing two million and forcing another two million to leave in desperation as they sought refuge in places such as Canada, the United States, and Australia. McKennitt, who is Canadian, shared this immigration story at the end of her first set, interweaving personal journal readings, poetry, and song into a 20 minute account of this tragic period of Irish history. Particularly poignant was her description of how doctors and nurses selflessly tended to the Irish as they entered Canada, many of whom were seriously ill with typhoid or cholera. Alternating between her Lyon and Healy Troubadour harp and a grand piano, McKennitt's performance was a tour through some 30 years of recording and included Stolen Child, Bonny Portmore, and The Mummers' Dance as an encore. She also proved quite adept at relaying humorous stories from her travels through Ireland. Having gotten off a train one day, she needed to exchange some currency. She asked the driver of a bus sitting at the station for directions to a bank, which he promptly provided. Worried about whether the bank would still be open in the late afternoon hour, she queried the driver yet again only to be told it had been closed for 30 years. Lavelle's cello work was as impressive as I've seen in quite some time and guitarists could learn a lot by observing her nimble vibrato technique. She also played the recorder and provided vocal harmonies when called for, her voice a terrific complement to McKennitt's. On guitar, Hughes alternated between an electric and several acoustic guitars, providing the traditional Celtic sound with his acoustic work. On his Fender Strat, he demonstrated the possibilities available to guitarists with the processing available through iPad modeling, adding a synthesizer sound as he moved around the neck. McKennitt turned the 2,700 seat Schnitzer into one of the most intimate concert settings I've witnessed, especially in a room that size. Not an easy feat. Let's just hope we don't have to wait very long for her to return. 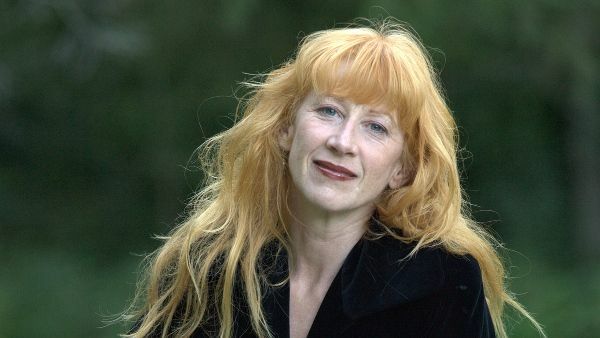 ON TOUR: Loreena McKennitt performs Friday night at the Hult Center for the Performing Arts and at the Paramount Theater in Seattle on Saturday to close out her current run of dates. A limited amount of tickets are available for Eugene and a very small number of tickets are still available for her Seattle show.